Cables: Transparent MusicLink / MusicLink Plus / MusicWave Plus. Renowned Welsh (Tolkien) composer Paul Corfield Godfrey is best known within the Tolkien world for his extensive four part Silmarillion operas (of which piano/vocal scores are available on his website); however his Tolkien repertoire is much more extensive than that, considering that the composer has been composing Tolkien music for over fifty years by now. Mr. Corfield Godfrey was first introduced to the works of Tolkien in 1956 by his then sister-in-law Lois Mitchison (daughter of Naomi Mitchison) who gave him a copy of The Hobbit. Only about ten years later he got to read The Lord of the Rings. In 1968-1969 he started working on operas based on The Lord of the Rings and later on based on The Silmarillion; for the latter he was aided by Christopher Tolkien. The young Mr. Tolkien allowed the composer to see and use various versions of texts which later found their way into the History of Middle earth. All of the ‘Tolkien material’ used by Mr. Corfield Godfrey is being used and/or published by permission of the Estate and HarperCollins as the publishers of the late JRR Tolkien. Recordings of his works are rare and few. Fortunately this is slowly changing. There has been a series of orchestral suites based upon various of Mr Corfield Godfrey’s Tolkien operas such as The Hobbit and a symphony based on the Ainulindalë chapter of Tolkien’s Silmarillion epos with the same name. His most recent Tolkien works include a ‘Legend for organ’ called Umbar and the symphonic song The Lay of Eärendil. The composer’s earliest Tolkien works presented on this CD is the Op. 9 -Tolkien Songs-, starting with Strider, track 2. It was written in the early 1970s while in the process of “contemplating an even more extravagant cycle based on The Lord of the Rings and incorporating The Hobbit, which would be spread over thirteen full evenings” – a substantial number of works was even completed. The second work on the album are the Op.9 Tolkien Songs, a series of six songs from The Hobbit and The Lord of the Rings. The series starts with Strider (All that is gold…), wonderfully joyfully sung by baritone Adam Jondelius, a light and somewhat joyful song especially if you are used to the much darker version from ‘The Tolkien Ensemble’. The series continues with Song of the Eagle brightly sung by soprano Tara McSwiney. It is very tempting for me to compare this song (just for the fun of it) to Stephen Oliver’s version for the BBC radio adaptation of The Lord of the Rings, but I won’t. On this album Tara McSwiney demonstrates she can handle various styles of music; in this song she demonstrates she has an ‘old soul’ in her voice and does a wonderful traditional ‘vibrato’ (or trilling) with her voice. This is a real demanding task in the higher register of the voice if you still want the words to be audible and distinguishable. She does a superb job in the tradition of the great opera divas. On track 8 of this album she sings the Op.33 Shadow-Bride; this song is in style much more modern than the Song of the Eagle which is more ‘classical’ if you will, and with a more subtle use of the ‘vibrato’ style and some very neat ‘clear’ passages she truly demonstrates she can manoeuvre her voice to great effect in either field. Talking of Shadow-Bride the performance of the viola by Niamh Ferris is excellent, lovely tremolo’s very neatly balanced with the piano and the vocals. Niamh Ferris is part of the highly appraised ‘all lady’ Mavron (string) Quartet. The title track was composed at the request of James Meaker but lay in wait for many years until Connor Fogel (the performer on this recording) took it up. Akallabêth is a rondo for solo piano and I own a version as performed by the composer himself. It is a very demanding work and incorporates many elements of the whole of Mr. Corfield Godfrey’s Tolkien music. According to the composer the performer (with his consent) made a few tempo alterations which are in favour of the work. The piece is dynamic and demanding but tirelessly performed by Fogel. The composer told me this work was commissioned but lay in wait before it was finally picked up by Fogel. Without offending the pianist who commissioned the work initially I’d like to say it waited in just for Fogel to take it up. In comparison to the version played by the composer on a synthesizer (of which I own a copy) this version is so much more alive, I don’t know if it is because of the tempo changes or the fact this is recorded on a real piano, either way it is a great piece of music that many pianists will find challenging, but I feel it is a piece well worthy of becoming a standard work for pianists who like to distinguish themselves from their peers. The performance of the work is excellent, Nicola Loten (on flute) really breathes life into this wonderful piece. Those whom have heard the synthesized version will notice the close resemblance the performance has to it. In my audio-system (I’m an audiophile by nature and for details on my system see at the end) I could distinguish breaths and the clinking of the valves of the flute which really gets me into the piece and tells me this is real and not a dream. I’ve been in the fortunate position to have heard three samples from an earlier recording, including The seven woods of Coole (track 12), a poem by William Butler Yeats. It is a beautiful fragile performance clearly performed in a traditional style. Its opening words remind one vaguely of the Tolkien poem ‘In the willow-meads of Tasarinan…’ (perhaps because of the Tolkien Ensemble’s version that was recently on my mind). The song on this album is sung by Adam Jondelius who takes the listener by the hand and walks with you into the seven woods. Mr. Jondelius, who does a wonderful job, don’t get me wrong on that, performs this song with a more down to earth kind of performance than the earlier recording. However what I loved so much about the earlier recording that I heard was its ethereal fragile feel were the singer really took me wandering about in the seven woods on my own rather than take me by the hand as this performance does. It still is a wonderful piece and very enjoyable. The second song I’d like to talk to you about is The Queen of Air and Darkness, where it all comes together; it is a song sung by the three singers on this album and guided by the main piano player (Immanuel Carl Maria Vogt who does a superb job throughout the album). The singers who had proved themselves throughout this album to be excellent singers take up the challenge to sing together, which they do equally professionally. I’ve have no idea of the truth of the following, but I imagine a recording chamber or stage with a piano at its centre and these three singers standing near it, or even leaning on it, and enjoying themselves; this song really ‘sparkles’ with joy from all the performers, one can feel the performers are very comfortable with each other’s company. Overall the recordings seem to be made in close proximity of the microphones (or so one does suspect) which provides an audio-image to the listener in which he (or she) might feel to be in close proximity of the performers, as if they are performing in your living-room. This (proximity) might give the listener the idea that the instruments and performers seem larger than they perhaps are in real life. The acoustics are fine, the quality of the recording is otherwise excellent, the instruments and voices are nicely separately audible and the words sung are very well understandable. This might not be an audiophile recording but it certainly is not a cheap rip-off you can buy in massive quantity with little to no quality in any convenient store, this recording is excellent and well worthy of your attention, and above all its price can’t be an issue. 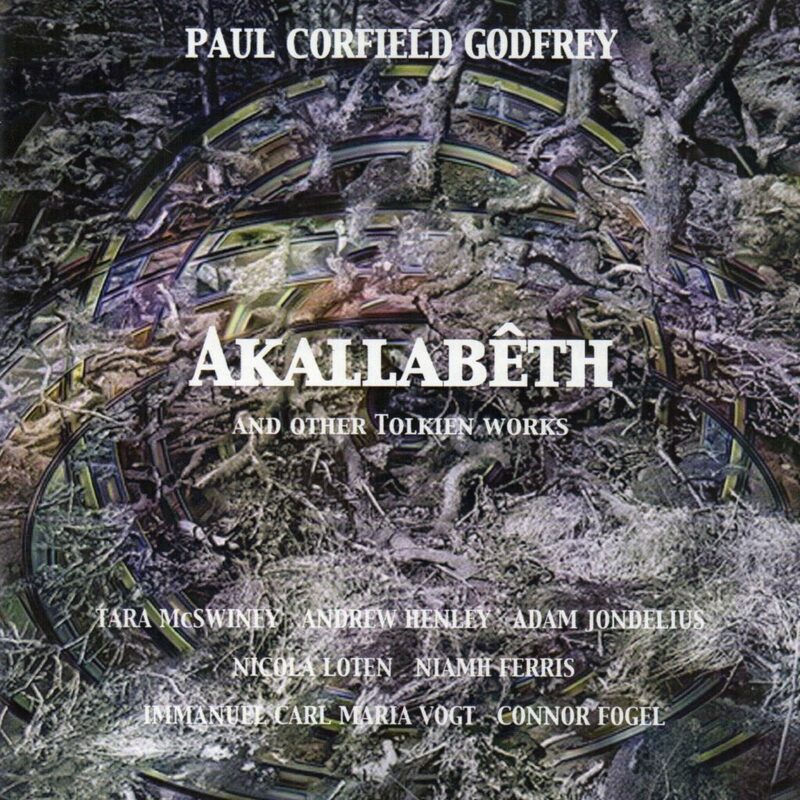 This is but the top of the Lonely Mountain of what musical Silmarils this composer might shine in Tolkien’s Middle-earth, and the transition of the music from the synthesized versions of his scores to these marvellous recordings prove Paul Corfield Godfrey to be a great composer worthy of a broadening of performances and recordings. So if you want a new music to descend on your Middle-earth or simply add something special to your classical collection, go run through the seven woods (beware of the Queen of Air and Darkness) to get your copy of this album, sing a Drinking song and run back through Western lands on Roads that go ever ever on and hide like Strider in your perfect audio-spot and listen to this recording, being Alive without breath and let The mystery begin. Jeroen Bakker (Huinelassir Arestë) a humble and kind supporter of the works of Mr. Paul Corfield Godfrey.